Save costs, comply with strict legal and environmental regulations, ensure operating reliability, safeguard round-the-clock operation, check and monitor drilling sites and pipelines in real time: The powerful, intelligent EFOY Pro power supply solutions from SFC Energy support operators of off-grid oil & gas installations all around the world in their efforts to fulfil the most difficult of tasks. EFOY Pro fuel cells supply electrical energy in an eco-friendly manner with lengthy autonomy without any need for top-ups or maintenance. They are available in a range of power classes in compact solutions, as weatherproof boxes, on trailers or in switching cabinets. 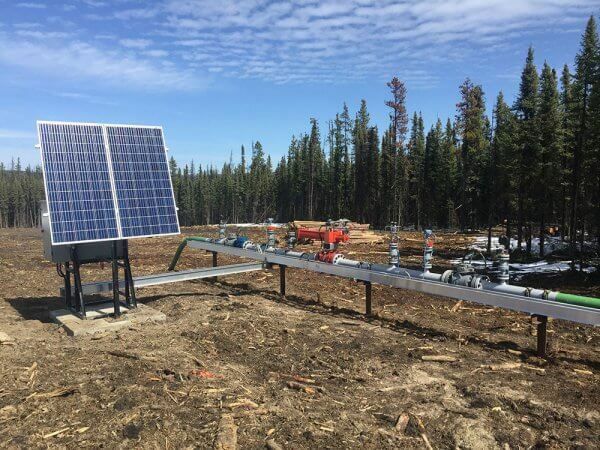 Simark Controls Ltd., a company of the SFC Energy Group in Canada, supplies custom-developed and produced intelligent automation, control and measuring solutions for the oil and gas industry. Simark’s experts assist customers with their many years of technological expertise, comprehensive application experience and innovative industrial solutions with even the most challenging of tasks. We have purchased an EFOY Pro fuel cell and have tested it for a year. We installed it in our mobile security system for the oil & gas business and it has run for 5 months completely autonomously. We just love it!